We are very excited to announce another very unique event on Performance Management. 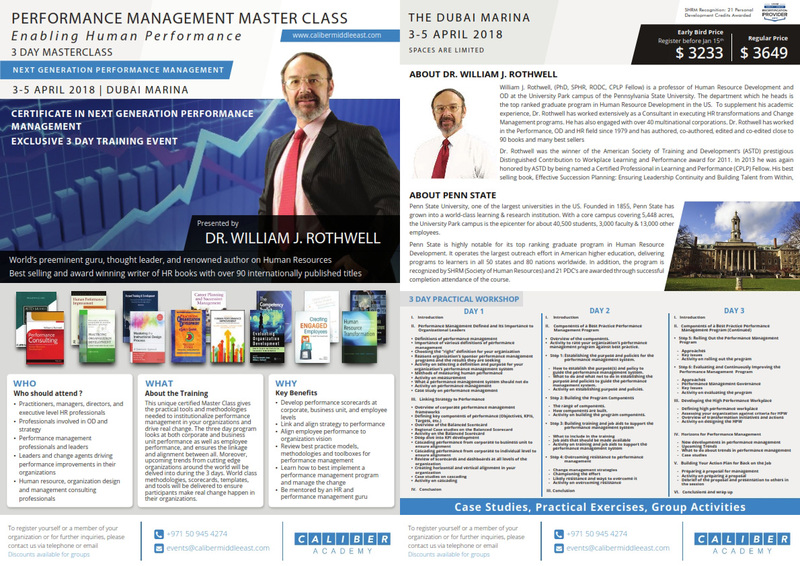 This certified program will be run by Dr. William Rothwell, one of the world’s leading thinkers and top 5 gurus on elevating human performance in the workplace. This 3-day Master Class will look at performance management at all key levels-corporate, business unit, and individual and aims at giving a comprehensive toolbox to ensure alignment across all levels and drive performance in your organizations. This program also looks at next generation performance management techniques and frameworks being used in the cutting-edge organizations of today. Official certification recognized by the Society of Human Resource Management (SHRM) and HRCI (Human Resource Certification Institute) will be provided as part of the program.